That wee-little thing to your left is boring, like way boring, and we’re looking to make a change. From now, until late November (or whenever a logo is selected) we are holding a logo design contest. Send your logo(s) to: info@lureofthenorth.com for a chance to win! 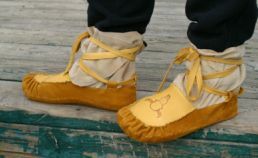 Custom made, moose-hide moccasins, with or without a wrap around upper (as shown). Shipping is included. This will include a custom burned image of your choice (if desired) and a pair of insoles. A $100 value. Goes equally well with or w/o the Lure of the North name attached to it. Good luck, we look forward to your entries!